This page will explain how to set the supervising provider on a claim in TRAKnet. Some insurance companies require a supervising provider to be present on a claim. 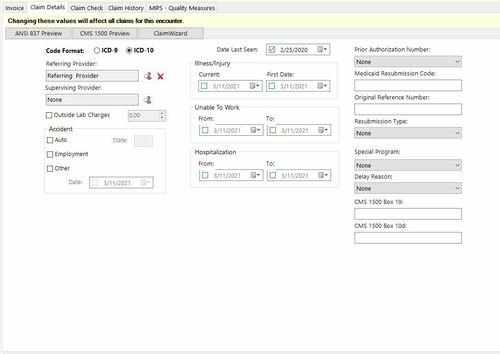 Supervising providers can either be manually added to a claim or defaulted to a claim in TRAKnet. To default a supervising provider, go to Tools > Options to open the Options menu in TRAKnet. The options menu is broken down into several categories, the first of which is Billing. Under billing there is a "Set Supervising Provider on Claims" field, which is defaulted to None. Setting this field to one of the available options will cause: 1. the supervising provider will begin to default and 2. it will default to whatever is selected. Rendering Provider — The provider listed under the Provider portion of the Encounter. Primary Care Physician — The provider listed under the Demographics for this particular patient, in the Primary Care Physician field. A provider must first be added to TRAKnet before they can be set as a Primary Care Physician or Referring Provider. To do so, check the Referring Providers page of this wiki. Referring Provider — The provider listed under the Demographics for this particular patient, in the Referring Provider field. A provider must first be added to TRAKnet before they can be set as a Primary Care Physician or Referring Provider. To do so, check the Referring Providers page of this wiki. If only one insurance requires the supervising provider, or requires a certain provider be the supervising provider, this can be defaulted on the Insurance level as well. To do so, go to Properties > Insurance > Modify the desired insurance to open the Modify Insurance Company window. After making a selection, click Save to save this option. 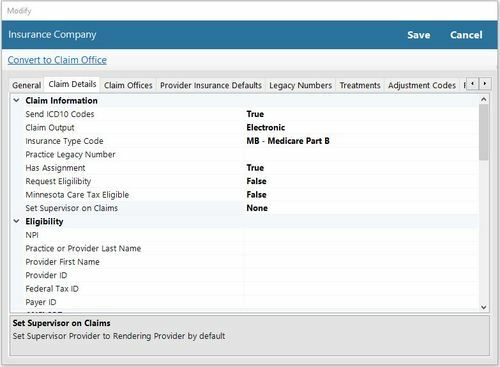 Supervising Provider will populate on the Invoice > Claim Details tab of an encounter if the above settings are in place and the provider is listed on the patient's demographics. If these two criteria are not met, however, the supervising provider can be set manually at the time of creating the claim. From the Encounter > Invoice tab, click on Claim Details. The claim details tab is where additional information about this claim will be entered, including supervising provider. 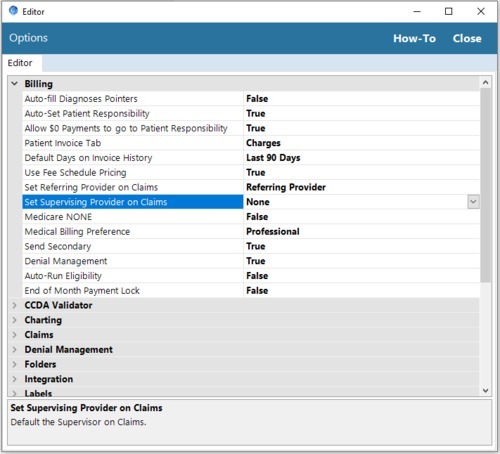 Supervising provider can be found in the first column of the claim details screen, the second option, titled Supervising Provider (as seen to the right). To add a provider, click on the Provider Lookup icon (a magnifying class over a person) to open the list of Referring Providers entered in your system. To show all providers, check the Show All box and click Refresh. To search for a provider, enter in the providers last name, first initial and click Search. You may also add a new provider from this screen by clicking the green Add button and filling in all the required information to add a provider. Once the provider has been found, click on the provider from the list, then click OK. This will close the Lookup Information window and return the user to the claim details tab, where the selected provider will now be listed under the Supervising Provider field. To confirm that the supervising provider has been added, on the claim details tab, click the ANSI 837 Preview. Supervising Provider will populate in loop 2310D.